Linden has been the home of either a lawyer or judge since its existence. Mr. Henry Williams, son of the minister of All Saints Episcopal Church and a Calvert County lawyer, built Linden in 1868, around the time of his marriage to Georgeanna Weems. Their children were born at Linden and they most likely would have remained here if her father hadn’t died suddenly and the Williams were forced to move to Baltimore in 1875 where Henry took over running her father’s company, the Weems Steamboat Line. Judge Daniel Randall Magruder, a native of Annapolis, was Chief Justice for Calvert County and the youngest judge ever to be seated in Maryland. He lived at Dare’s Hotel in Prince Frederick before and after marrying a local girl, Mary Sollers, and starting their family there. By the time they moved into Linden in 1875, two of their three children had died and been buried in St. Paul’s cemetery and the following year, 1876, Mary Sollers Magruder followed them. Her mother, Rebecca Sollers (sister, and brother, Solomon Sollers, who later became Clerk of the Calvert County Circuit Court,) moved into Linden with Daniel Magruder, ran his house, and helped to raise his daughter. Magruder continued to serve as a judge for the southern Maryland circuit, he had a law office in town, and invested heavily in property in Prince Frederick, including a store and the same hotel where he and his wife had lived earlier. He became President of the Baltimore and Drum Point Railroad, managing negotiations and seeking investors to fund its completion. In 1881 he left the in-laws in Linden, returned to Annapolis to practice law, and soon remarried. When the 1882 fire(s) in Prince Frederick burned the Courthouse, it also destroyed his investments: his law office, a store, and the hotel, but Linden was untouched. Unfortunately, Magruder had reduced some insurance coverage to put more money into the railroad project , and his financial security diminished with reduced rent payments and new construction cost. The Drum Point RR project was also doomed, and before the decade was over, Linden was sold on the (new) courthouse steps. At that courthouse-steps sale, Linden was purchased by John B. Gray, another Calvert County lawyer. Judge Magruder prevailed on him to let his personal friend, John Parran Briscoe, a lawyer and later a judge, to live at Linden while his future home, Old Field, was being built in Prince Frederick. Gray agreed, possibly in the interest of goodwill and legal collegiality, or because he had known Briscoe also wanted to buy Linden and was only prevented from doing so as he was out of the county on court business the day it went up for sale. John B. Gray purchased Linden in 1887 and moved there in 1889. He and his wife, Kate Lavielle Dorsey, already had three daughters; three sons would be born in the succeeding years. In the early 1900s are said to have planted the linden trees in the front of the house that gave it its name. The John B. Gray family owned Linden for 100 years although the land that surrounded it was reduced over time. In the 1920s, land just to the west of Linden was given to John B. Gray Jr. when he married. He built a house there and raised a family of his own. Beyond that, another portion was used for the first county hospital (now the Sheriff’s Department,) and beyond that, son Dorsey Gray’s car dealership was built. John B. Gray died in 1937 at the age of 84. His daughters, Miss Marguerite and Miss Sadie Gray, continued to live in Linden until their deaths in the late 1980s. The estate sold the house to St. Paul’s Episcopal Church; it later became Project Echo, a homeless shelter. 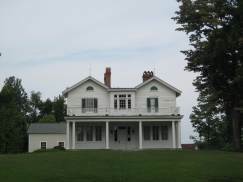 In the 1990s, Calvert County purchased the Linden property and came to an agreement with the Calvert County Historical Society: CCHS would rent Linden for $1 per year and pay for the new Archives wing and a full rehabilitation of Linden. 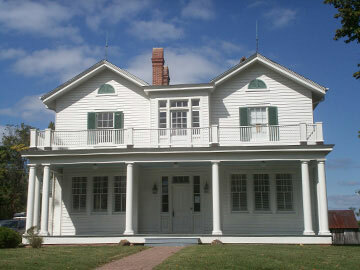 With the help of Federal, State, and Local funding and support from members and friends, Linden became the new headquarters of the Calvert County Historical Society in 2000; the Linden rehabilitation was finished in late 2006. Today, Linden houses the Society’s research library and archives, a museum gift shop, provides a venue for CCHS historic programs, and meeting space for other non-profit groups as well.